And ranking on the first page of search engine results is the holy grail of content marketing. There are tons of articles out there promising SEO “hacks” and sure-fire ways to game the system. But short of buying search engine prominence through sponsored listings, the truth is that SEO takes time. By focusing on “evergreen” content. In this post, I’m going to talk about why search rankings don’t always come quickly, but how evergreen content can keep you on the first page once you’re there. Anyone with even a passing acquaintance with SEO best practices knows that there really are no shortcuts. The history of SEO has been a kind of tug-of-war between search-engine providers who want to serve up the most relevant and useful content to users who are looking for information, and the content producers who want as many eyeballs on their material (and ultimately, on their products and services) as possible. And the game keeps changing. Once upon a time, having the right keywords in your content was enough to get you on that all-important first page of results. But techniques like keyword-stuffing started to skew the results, so the search engines changed their algorithms. Today, SEO is driven by more natural language search, mimicking how people normally ask questions, rather than a few magical keywords. Search engines also like fresh content. This drives many companies to churn out blog post after blog post, in an effort get a spike in their traffic that they hope will catch on. But this focus on volume is short-sighted. It doesn’t pay off in the long run. Marketers get stuck on a hamster wheel of content creation. Their posts deliver a burst of traffic at first (if they’re lucky) but then seem to fall into a black hole as far as the search engines are concerned. And the more “noise” there is, the harder it is to stand out. But here’s the thing. Rankings are not as important as results. To paraphrase Seer Interactive founder Wil Reynolds, there’s a danger in mistaking outputs for outcomes. 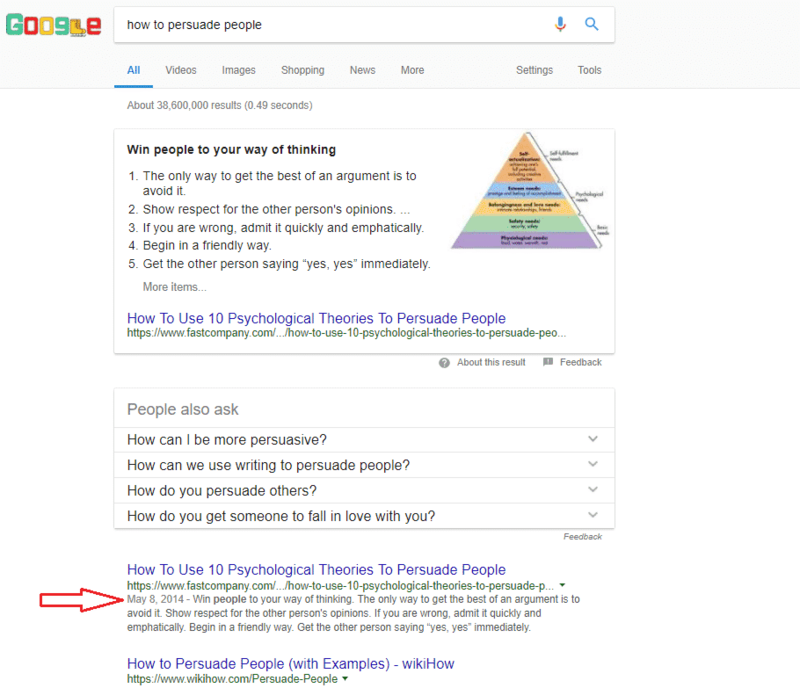 In other words, showing up on the first page of Google results may be a boost to the ego … but if it doesn’t translate into any leads or sales, has it really paid off? Maybe the real question is, how long does it take SEO to deliver results? The good news is that when SEO works, it rewards both users and the companies that provide the content they consume. Google and other search engines now prioritize content that users tell them is useful — through the amount of time users spend on a page, and the number of times they link back to it from other resources. I’ve mentioned this HubSpot study before, where the HubSpot team analyzed the traffic for over 20,000 blog posts. They found that what they called “compounding” posts continued to generate more and more traffic months and even years after initial publication. “Decaying” posts, on the other hand, delivered an initial surge of traffic, but quickly faded in relevance, often within days (if not hours) of being published. By HubSpot’s calculation, one compounding post drives as much traffic as six decaying posts over its lifetime. So what did these compounding posts have in common? For one thing, they were all intended to help their readers. Some were written on a broad topic but contained tactical advice, such as what elements to consider when making a choice about something (for example, “Keep These Three Things in Mind When Choosing the Email Marketing Platform for Your Business”) or telling readers how to do something (for example, “How to Write Killer Headlines”). More often than not, they answered questions that were common in an industry — questions that were likely to come up for people again and again. In other words, subjects that never got old. And that makes sense, right? Good content should educate a reader, and help him solve a problem. As entertaining as those annual round-up posts of “the hottest trends of 2018” may be, they don’t age well. While there’s no silver bullet to make sure you rise to the top of any search engine’s rankings, there is something that can increase your odds. Evergreen content is your secret weapon in the SEO game. It’s content that never goes out of date. It stays relevant long after its initial publication because it addresses a problem that your audience has, explains a concept that someone still needs to understand, or teaches the beginner how to do something new. Evergreen content can take many forms: a blog post, a video, even a white paper. But the key thing about evergreen content is that it’s useful. The best part? It boosts your organic search traffic precisely because it’s so useful to its audience. 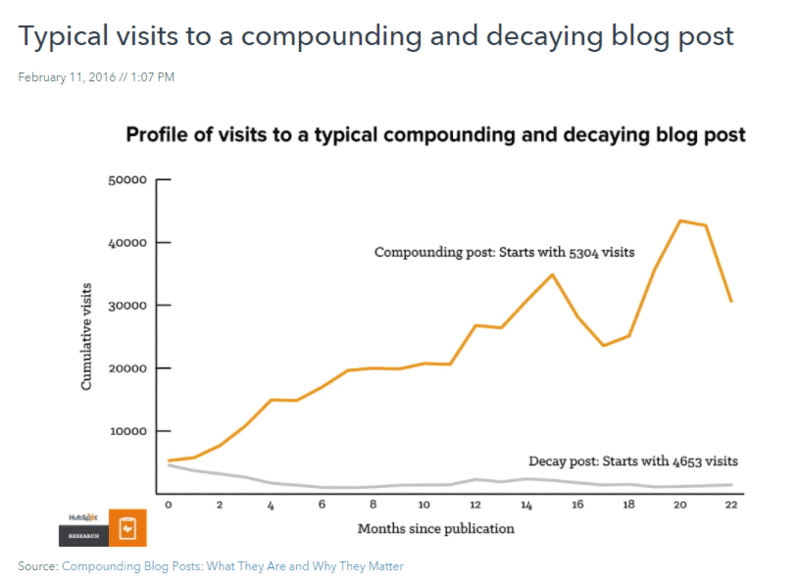 In fact, as HubSpot’s study of compounding posts shows, the longer it’s around, the more traffic it generates. Because what do people do when they find incredibly helpful content? Quality content becomes a resource for other people writing on the same subject. Once you’ve established your content as helpful and trustworthy, other authors will link back to it — especially from other high authority domains. These backlinks are a very strong signal to Google and other search engines that a piece of content is authoritative and valuable. So as a piece of content generates more traffic, its search authority increases. It gets found more. It’s a virtuous cycle. Notice the date on the very first entry? Try that query yourself, and see how many entries on the first page are three years or older. That is the power of evergreen content. But remember, the key to effective evergreen content is quality. Evergreen content can take on a variety of forms. How-to guides, case studies, interviews with thought leaders in your industry … even curated lists of resources to help practitioners in your niche. But the one thing it must do is engage and inform its audience. One more thing. Search engines (and Google in particular) tend to favor longer form content in their rankings, so don’t skimp on depth and detail. 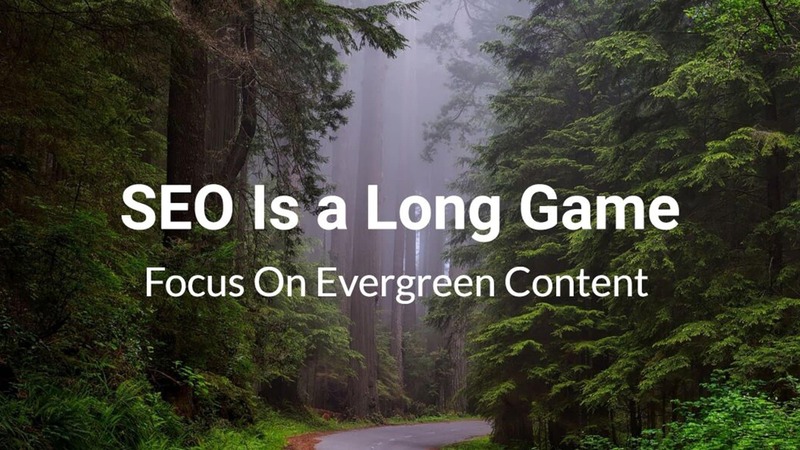 The investment you make to create good evergreen content will pay for itself in the long run. Are You Focused on Outputs, or Outcomes? No matter what some marketing gurus may claim, the truth is that SEO is a long game. Gone are the days when you could trick search engines into ranking your content higher than it deserved. Once you understand that only the most useful content drives traffic, you’ll shift your content marketing priorities for long-term gains. Evergreen content not only builds your authority, it works harder than almost any other marketing asset. When you answer your audience’s most common questions, address their most painful challenges, give them actionable advice on how to solve a problem … well, you won’t be worrying about driving search traffic for long. Is your blog a publication — or a library?